A-Man was Buddy Baker, a movie stunt man who happened to witness the crash landing of an alien space ship. He was bathed in strange radiation from it, and as a result became able to absorb the abilities of nearby animals. This happened in Strange Adventures #180 (September, 1965). The story was probably written by France Herron, Captain Marvel Jr.'s original scripter, tho there is a possibility the writer may have been Dave Wood (Sky Masters, Ultra the Multi-Alien). (Wood definitely did write subsequent adventures.) The artist was Carmine Infantino, whose many credits include DC's Flash and Marvel's Nova. Tho Buddy found it very nice to have super powers, he wasn't particularly motivated to put on a costume and fight crime — which may have been why it was four issues before he was seen again, and six issues after that before he actually did put on a superhero suit. He didn't have the name quite right in Strange Adventures #190 (July, 1966), but he did have a huge initial on his chest to emphasize the name he was using. He had a couple more stories in Strange Adventures (the last in #201, June 1967), plus a guest appearance here and there, then pretty much retired from superheroing. By the time he was seen again (Action Comics #552, February 1984), he had a wife (Ellen) and a couple of kids (Cliff and Maxine). He was dragged back into action by The Immortal Man, another guy who had made sporadic appearances in Strange Adventures during the late '60s, who gathered several forgotten heroes, such as Congorilla, Rick Flagg (of The Suicide Squad), Cave Carson (who'd been forgotten before he even got a regular series) and Dolphin (who had previously made one appearance in Showcase) into an organization called The Forgotten Heroes. Of the entire lot (which also included Dane Dorrance of The Sea Devils and Rip Hunter, Time Master), the only one who is particularly well remembered today is Animal Man (who was by then using his proper name). Unexpectedly, for a character with such a spotty history, he was next seen in his own comic book. Writer Grant Morrison, whose credits include Judge Dredd and an unusual take on The Doom Patrol, saw possibilities in a superheroic family man, and DC launched the title (with a September, 1988 cover date) to give him a venue for exploring them. The following year, Animal Man joined Metamorpho, Power Girl and several others in forming Justice League Europe, an offshoot of a 1980s revival of The Justice League of America. His involvement with the group lasted a year or so, but he was in his own comic for 89 issues, the last dated November, 1995. With its 57th issue (March 1993) it switched to the nascent Vertigo imprint, which DC uses for its more adult-oriented publications. In fact, with Sandman, Hellblazer and Swamp Thing, it was one of the line's founding titles. 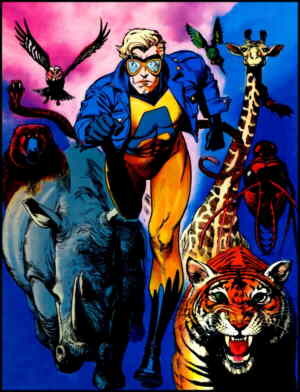 Throughout its run, the Animal Man title received a good deal of critical acclaim, and contained some memorable stories. Which means that even tho it's been several years since its hero had a series of his own, if DC ever again gathers its forgotten heroes together, he's unlikely to be a candidate. Text ©2004-08 Donald D. Markstein. Art © DC Comics.